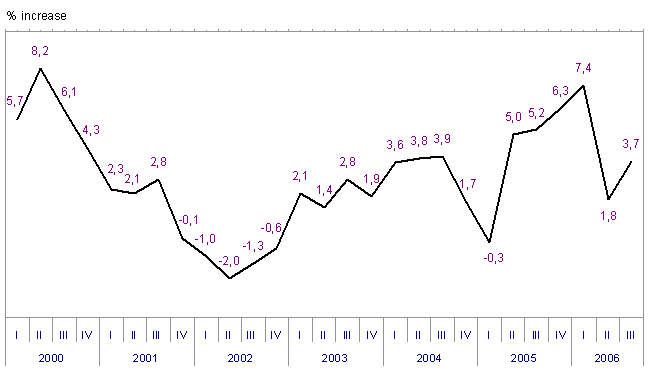 In September 2006, compared to August 2006, industrial production in the A.C. of the Basque Country grew by 3.2%, once corrected for seasonal effects. By sectors, bearing in mind the classification of large industrial sectors, the evolution of the index in September 2006 with regard to September 2005 presents varying variations in growth: Capital goods grew by 5.9%, Intermediate goods grew by 3.1%, Energy rose by 4.9%; but Consumer goods fell by 4.7%, as a result of the decreases in Non-durable Consumer Goods (-6.5%) and Durable Consumer Goods (-1.3%). 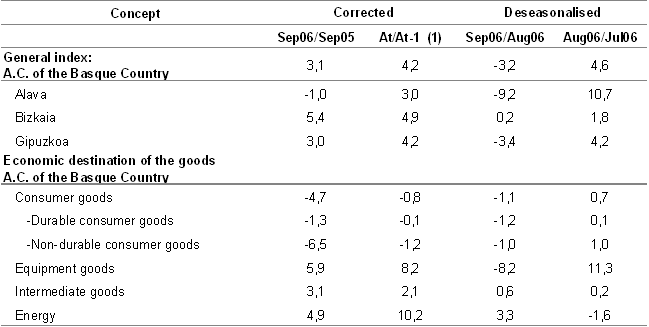 The inter-monthly variations for September 2006 on August 2006 were different for the industrial sectors. Capital goods decreased by 8.2% in inter-monthly terms, Intermediate goods grew by 0.6% with regard to the previous month, Energy rose by 3.3% and Consumer Goods decreased by 1.1% with regard to last August, due to the fall registered by Durable Consumer Goods (-1.2%) and by Non-durable Consumer Goods (1.0%). By provinces, the inter-annual evolutions of the Industrial production index varied: falling in Álava by 1.0%, increasing in Bizkaia by 5.4%, and in Gipuzkoa by 3.0%. The inter-monthly provincial rates, September 2006 on August 2006, rose in all three provinces, decreasing by 9.2% in Álava, 3.2% in Gipuzkoa, and increasing by 0.2% in Bizkaia.